Life, sometimes, is full surprises. Opportunities that shouldn't be missed. Luck and/or the odds are surely for something in this equation, but the best moments in life are usually very simple and often unplanned, happening somewhat by chance due to certain situations, circumstances and/or as consequences of certain actions. Recently, I wrote a nice post about my grandfather and my childhood in the vineyards with him. The post was very personal and sentimental to me. It was a way to remember my grandfather and what I miss about him and living in the countryside (read it here). It was the following of a previous post I wrote about him in 2010, about a year after he passed away (read it here). Like I do occasionally, I posted the article on my Facebook page and shared it on other Facebook pages. One of these FB pages is "Wine Business", where other wine bloggers, journalists, producers, and other professionals actively involved (directly or indirectly) in the wine world, post articles and pictures. Interestingly, the post about my grandfather had a huge success and many readers, which I was really pleased by. And surprisingly enough, one of these readers was Loïc Pasquet from Liber Pater. I read many of his posts and articles from him and about him, Liber Pater and other subjects regarding the wine world, but I was far from imagining that he would read one of mine... but, after all, why not? Loïc contacted me via Messenger to tell me that he will be in Hong Kong for a few days early November and wanted to meet with me. At first, I was a little bewildered, as I don't know him, the company I work for doesn't buy his wine (yet...) and I was just wondering what could have triggered such interest to meet with me. After all, I'm just a rather unknown Wine Quality Control Director, Sommelier and Independent Wine Blogger, and not even in charge of the wine purchasing for the company I work for, and therefore not necessarily someone of interest for a wine producer like him. My insecure-self told him at first that I was not necessarily the person he would want to meet to discuss business or marketing strategy. But he told me that he just wanted to meet and discuss, not necessarily about business, but more about my opinion and views about the Hong Kong and China Market. Once again, I replied him that I was not necessarily the right person to talk to about that and may not have all the answers he was probably seeking, but then again that I was willing to discuss if he really wanted to and if his schedule allowed it. I mean what were the odds that such a meeting would take place? ... and that's what I meant by "life is sometimes full of surprises" and about "opportunities that shouldn't be missed". I've heard a lot about Loïc Pasquet and read countless articles about him, but the pleasure to meet him in person was a great opportunity to meet and converse with the mastermind behind the myth of Liber Pater. 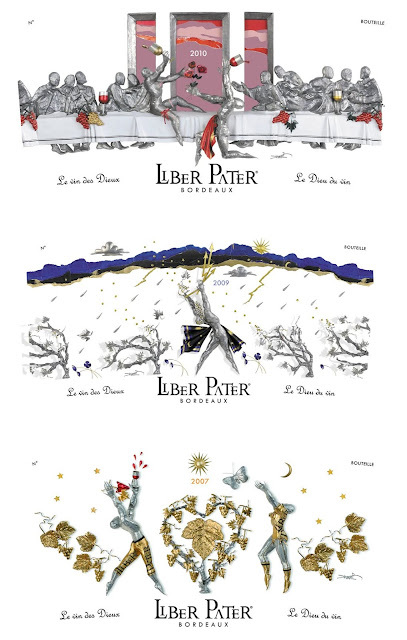 If I say "Myth" it is because "Liber Pater", which was not even established 15 years ago, is an unconventional success story and the result of the hard work, passion, and perseverance of one man: Loïc Pasquet. A man with convictions and determinations who believed in his project and pursue his dreams despite all the barriers and pitfalls the competitions, journalists and other administrations have put on his tortuous path to succeeding with a goal no one else believed in or thought it was possible: Recreating the taste of pre-Phylloxera Bordeaux wine by growing ungrafted vines and autochthonous grape varieties that used to exist in Bordeaux back in the mid-19th century. Loic said: "I replanted old pre-phylloxera grapes like Tarnais Coulant and Castet, as the idea is to rediscover the taste of Bordeaux wines that everyone was talking about, at the time of the 1855 classification, but that nobody knows nowadays." I was pacing the floor of his hotel's hall when he suddenly appeared. I recognized him easily having seen his portrait on many websites, posts and news articles. We shook hands and the conversation started immediately, naturally, almost like if we already knew each other. So, I relaxed a little, realizing that he was very approachable and talkative and that, after all, this meeting was totally informal and not subject to signing a business contract at the end. I offered him to have a drink, like a glass of wine, but he had 2 busy days lunching, dining and drinking, and did not want anything. We sat down at a table and I ordered a glass of Sauvignon Blanc for myself. My head was full of questions but at the same time I did not want to harass him with too many of them, so the conversation went on with basic questions from my part and detailed answers on his part. I immediately regretted not to have a voice recorder to record the whole conversation as it was so interesting, full of stories and anecdotes and references to historical moments and facts. It was quite fascinating to hear him talk. Originally from Poitiers, Loïc was a mechanical and chemical engineer, who also worked for the car company Peugeot at some point. He loved wine and was a wine collector, and was always impressed by the quality, complexity, and taste of the old vintage wines. He actively started to research on the subject and tried to understand what could confer this great taste, complexity and more especially aging capability to the older vintage wines. 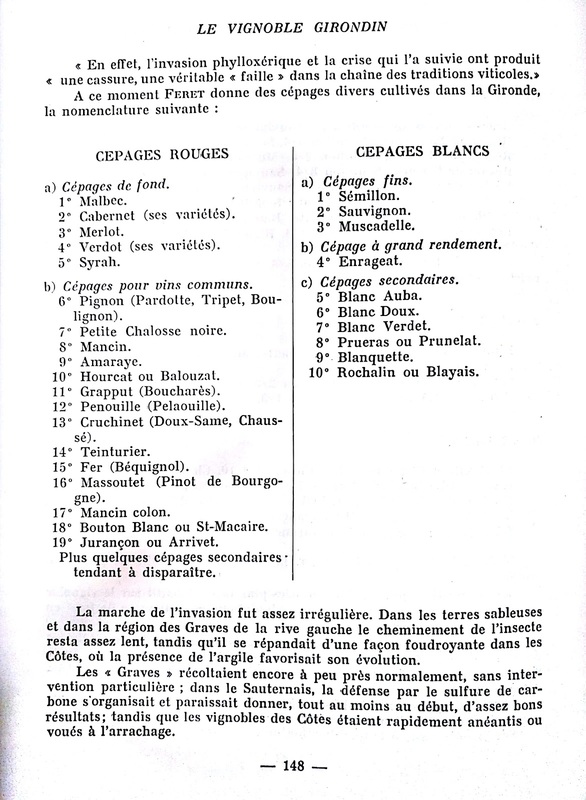 He read and researched abundantly about wine history and geography of the 19th and early 20th century, and realized that "Franc de Pied" (ungrafted) pre-phylloxera vines that had been planted into specific soils with characteristics most suitable for certain grapes varieties, were the keys for the complexity, taste and aging potential of the wines. "Franc de Pied" is a French expression literally meaning "direct from the foot - or the roots if you prefer", or more commonly said in the wine world "ungrafted", meaning that the vine has been directly planted into the ground and it is whole from the roots to the branches (stems/shoots) and has not been grafted on American root. The French word "Pied" (meaning "Foot") consists of the base of the trunk and the roots of the vine (see picture above). 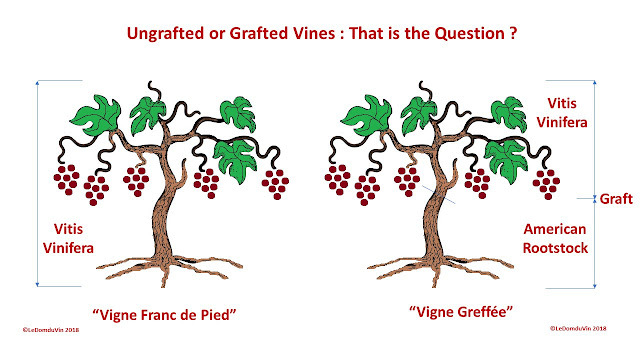 "Greffée" (meaning "Grafted") implies that a shoot or twig of European "Vitis Vinifera" vine has been inserted into a slit on the trunk or stem of a Phylloxera-resistant American rootstock vine (usually hybrid varieties created from the Vitis Berlandieri, Vitis Riparia and Vitis Rupestris species), from which it receives sap, so that it can grow and develop like if it was on his own natural roots. 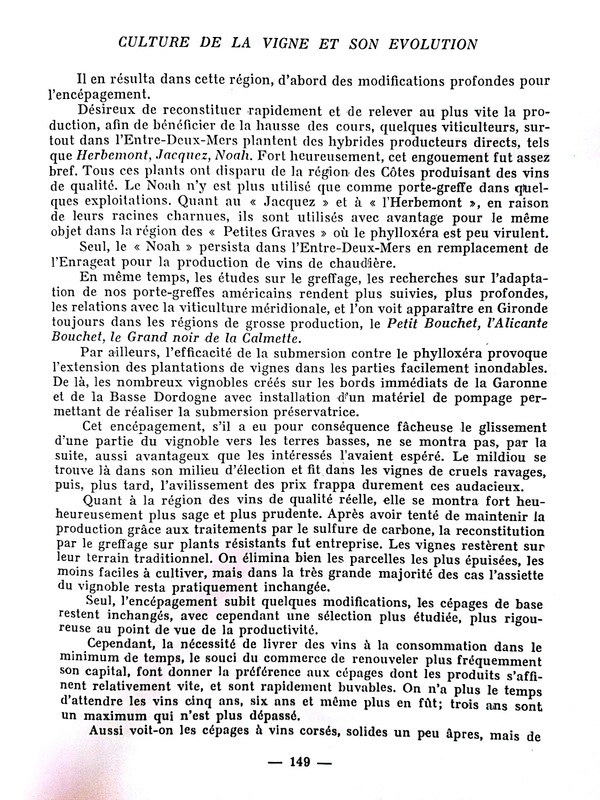 Grafting Vitis Vinifera on American rootstock was the only successful solution to counter the Phylloxera Vastatrix, a small American louse introduced accidentally in Europe, which spread rapidly across the old continent and devastated most wine regions in Europe, roughly between the mid-1860s and the 1920s. 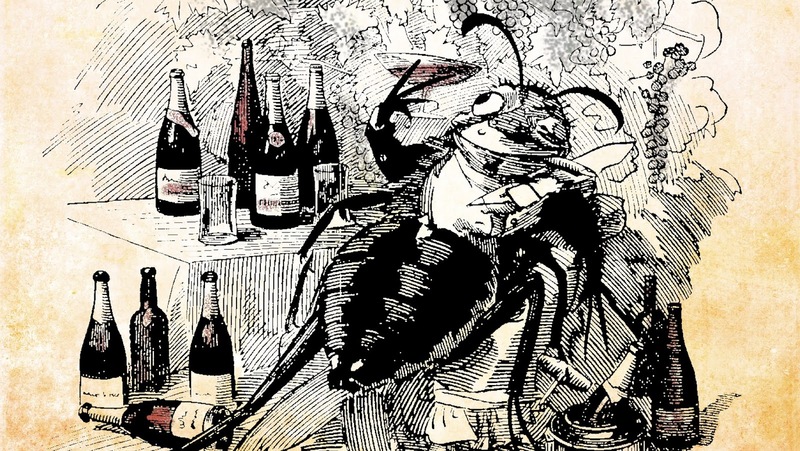 France was largely affected and despite a few areas with sandy soils, where some pre-phylloxera vines can still be found nowadays, overall between two-thirds of the European vineyards were literally destroyed during that period. The Phylloxera Vastatrix, originally native to eastern North America, cannot live on sandy soils and sub-soils, which is how some vineyards in some area survived the plague. Sandy soil types are quite effective at preventing the famous louse from attacking the roots, and thus also preventing it from living and reproducing. This small pale yellow sap-sucking insect, related to aphids, has two life cycles, the underground cycle, and the above ground cycle (see picture below). 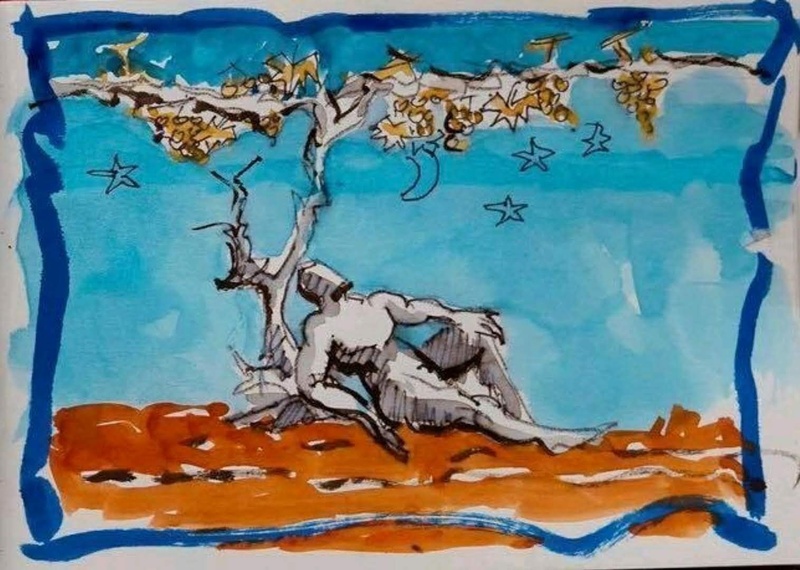 Hence grafting became the European norm and most Vinifera vineyards in Europe were uprooted (at great expenses and to the detriment of most producers), then grafted on American rootstocks replanted instead. It turned out to be a very effective decision, yet, contested and not appreciated by those who believed that American rootstocks may affect or even denature the taste of the wine, as acting as a sort of a « filter » between the soil, the native grafted vines, and the resulting grapes, which may not be as neutral as expected. 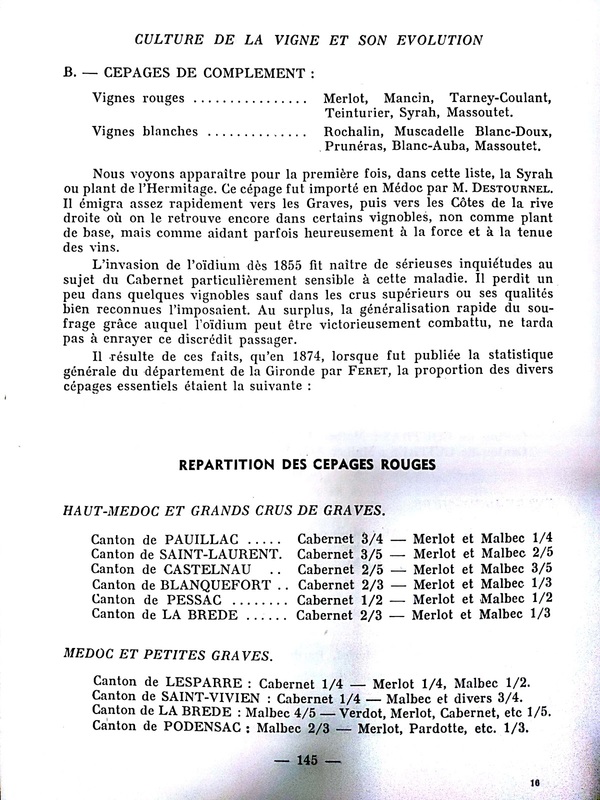 Loic cited the owner of Chateau Margaux saying, back in 1904, that after he grafted his vines he lost the taste and complexity his wines had prior grafting. 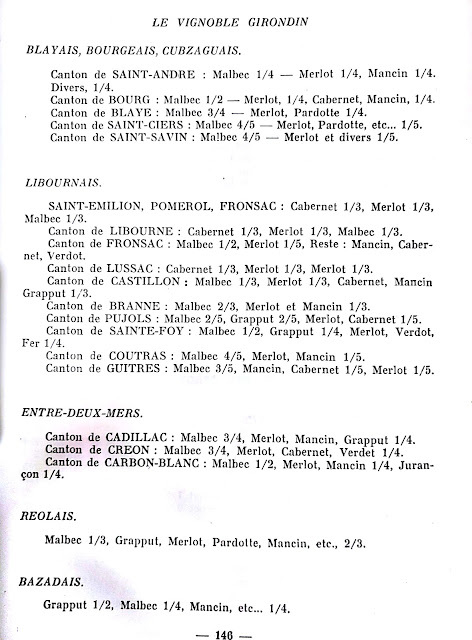 This is just one example among many others that made Loïc reflect on the subject, which in turn became an obsession and a goal for him: How to retrieve or recreate the taste of pre-Phylloxera Bordeaux wines? 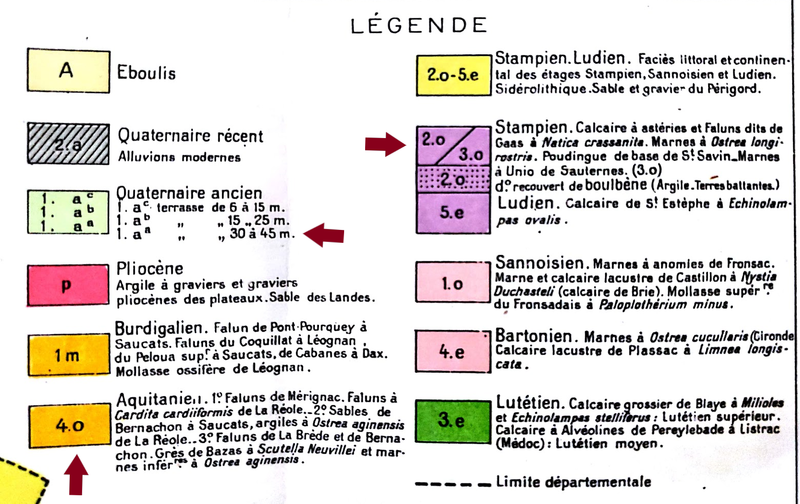 Loïc was convinced that ungrafted vines of specific autochthonous varieties planted on the most ideal and specific soils for these varieties are the keys to make the best wine possible and retrieve the taste and complexity of pre-Phylloxera Bordeaux wines (made prior 1860). So he went on a quest to find a parcel of wine to buy. After a certain amount of time searching in different regions for the ideal "Terroir" and what his wallet (at the time) could afford him, his quest landed him in the village of Landiras, a small village of the Graves area, roughly about 40 kilometers southeast of Bordeaux, and less than 9 kilometers northwest of Sauternes. In 2005, about 5 kilometers northwest of Landiras (see map above), he found and bought what looked like an abandoned parcel of old vines planted on gravel and sandy soils, atop a small mound at about 80 meters above sea level, which became Liber Pater. Loïc property encompasses about 7 hectares of vineyards planted on a spot with a very unique soil composed of old gravels, sand, and minerals. These are deposits of marine origins and continental origins accumulated there over the last 50 million years. 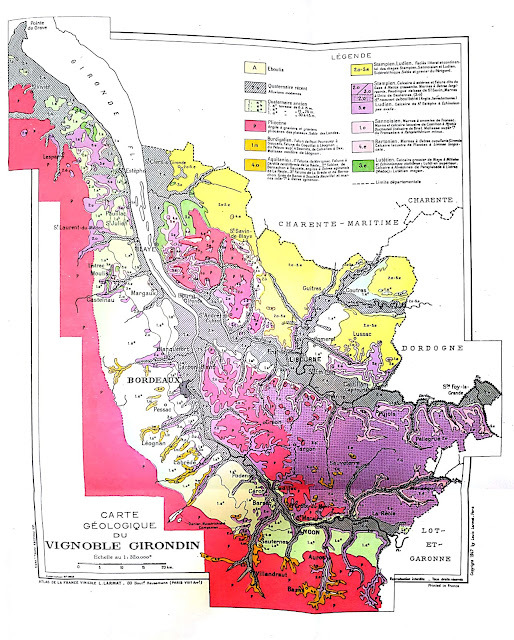 The various layers of deposits were gradually created over time by the numerous marine transgression and regression of the sedimentary basin of the Gironde (Bassin Girondin/Aquitain), also influenced by the various mass movements that occurred between the sea and the continents, and the proximity with the "Anticlinal Villagrains-Landiras" (see map above and below courtesy of Becheler Conseils (**) Map above revisited by ©LeDomduVin). 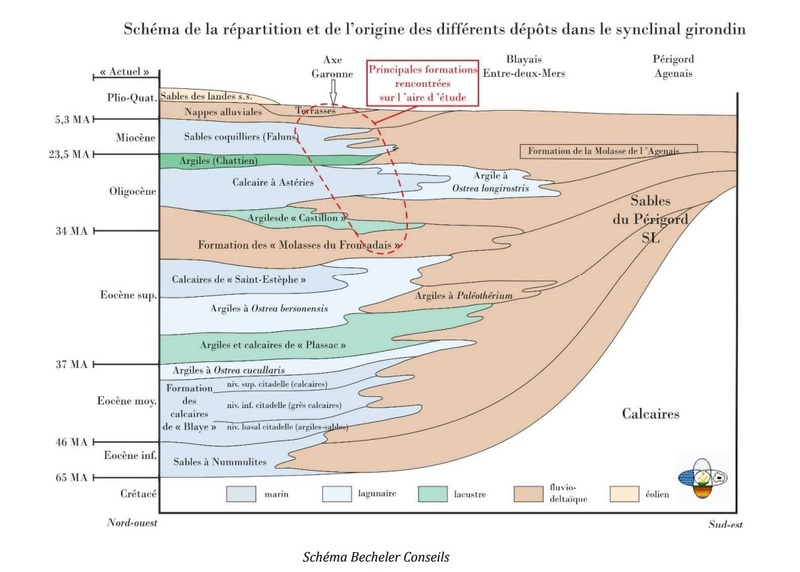 5.3 million years ago, the sea withdrew completely from the Aquitaine Basin (and the Department of the Gironde as a whole). This final marine regression dragged along parts of the continent due to the erosion of the soil and gradually deposited sand and clay and more especially gravel (pebbles) on its way on the emerged soils. Hence the name of the region "Graves", due to its significant amount of pebbles in the soils. Syncline refers to a trough or fold of stratified rock in which the strata slope upwards from the axis and Anticline refers to the opposite, the strata slope downwards from the axis (see illustration above). If I'm insisting on the type of soils, and more especially the layer of sand below the gravelly soil, it is because Loïc talked a lot about it during our meeting as a key factor preventing Phylloxera, thus enable him to plant and grow ungrafted vines. 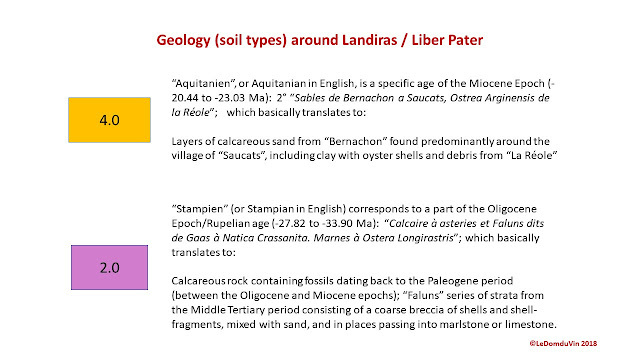 I tried to search and find on the internet a clear map of the soils around Landiras showing that specific spot where Liber Pater vineyards are located, in order to show you why his terroir and soils particulars are so "unique" in this area, but I was not able to find one. 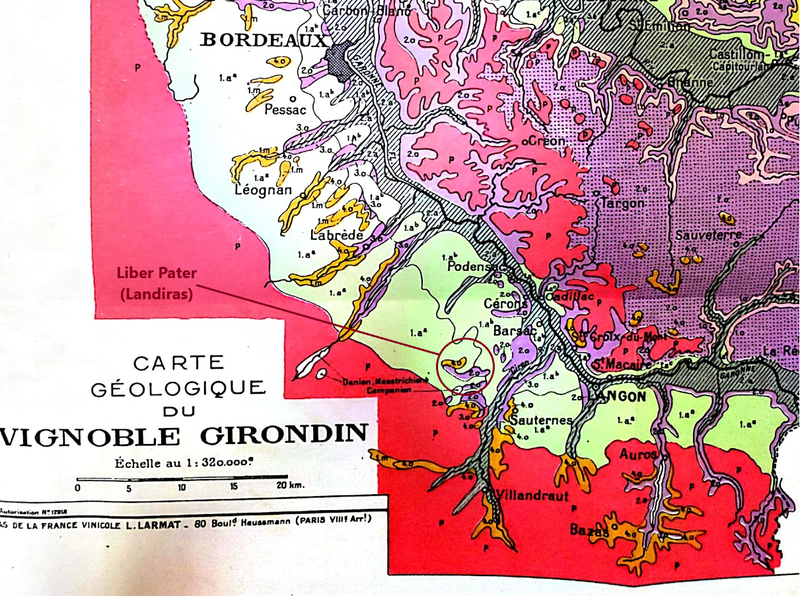 So, I look into my book collection and found an interesting map in a book I bought and posted about back in October 2017 (read the post here), called "Le Vignoble Girondin" by Germain Lafforgue, 1st edition from 1947 (Louis Larmat editor). "Le Vignoble Girondin" (by Germain Lafforgue, 1947) has become my Wine Bible, not to be mistaken with THE "Wine Bible" from Karen MacNeil, (for whom I have much respect and always admire, and her book has always been a source of references and part of my personal selected wine book collection since its first release back in 2001). "Le Vignoble Girondin" is a tremendous book and an invaluable source of references regarding the Gironde Department and Bordeaux vineyards, chateaux, and properties, with amazing details on the history, geology, topography, grape varieties, soils, terroir, climate, vinification, winemaking, aging and pretty much everything else in the world of Bordeaux wine. It is a must have and a must read for all Bordeaux wine lovers. 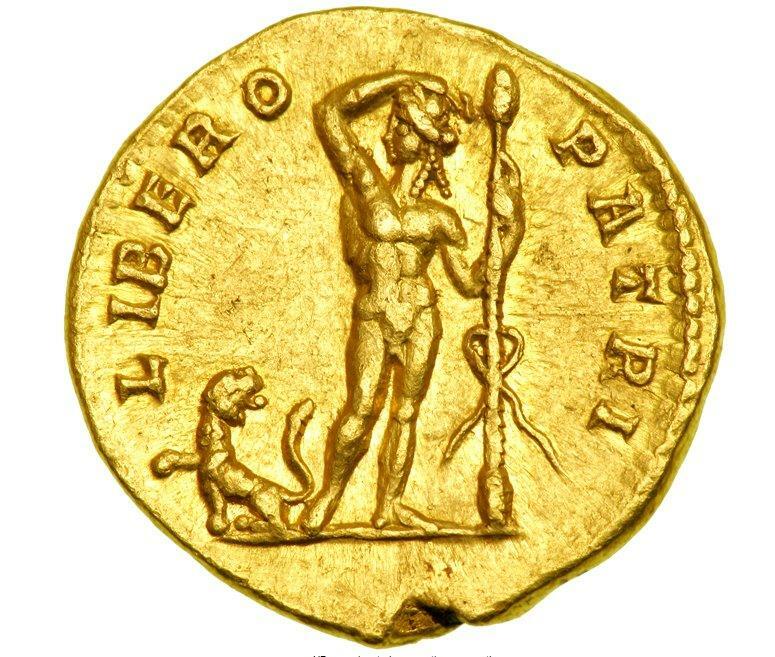 And, interestingly, it is, in my opinion, in direct correlation with Loïc Pasquet and Liber Pater, as the book describes in details exactly what Loïc has been inspired by. I will tell you more about it further below in the paragraph on the grape varieties. 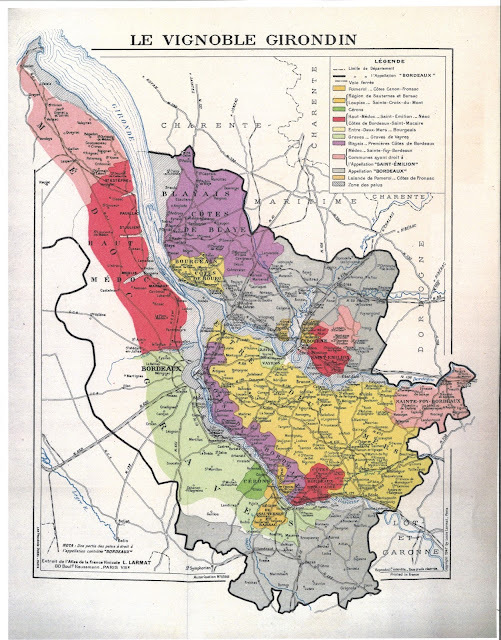 So, in this book, I found these two old maps of the Gironde and the soil types within the Bordeaux Regions. Now let's have a look at this great map of the soils of the Gironde and thus Bordeaux vineyards. I tried to find a more recent map, but was enable to either in books or even online. One more reason to promote this book as an invaluable reference. 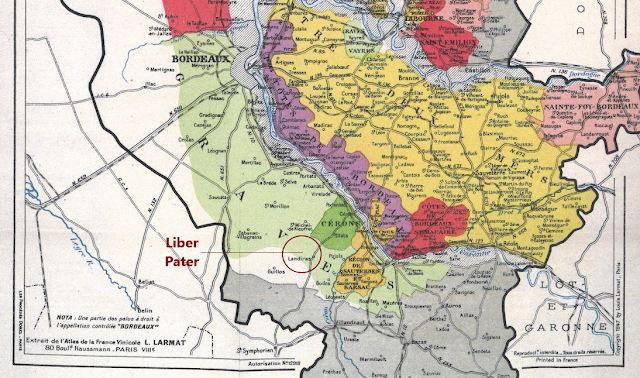 Like for the previous map, let's zoom into the map to have a closer look at the type of soils on which Liber Pater is resting. 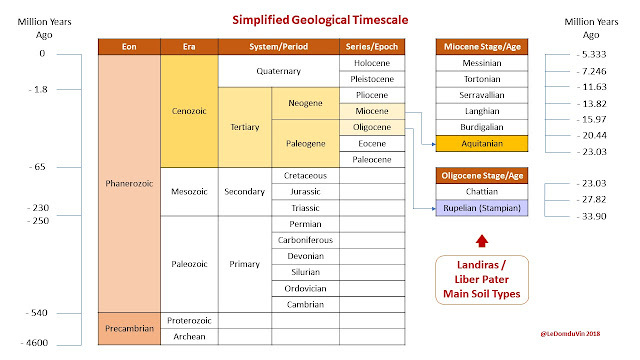 As you can now understand by looking at the location of Liber Pater on the map and the map's legends, the uniqueness of Liber Pater's sub-soil comes from the fact that the vineyard rest on a patch of calcareous sand and clay with oyster's debris dating from the "Aquitanian" stage (Miocene epoch - Tertiary Period) tipping a bigger patch of soil from the "Stampien" stage (Oligocene epoch - Tertiary Period) surrounded by low terraces of "Quaternaire Ancien" (Ancient Quaternary Period). 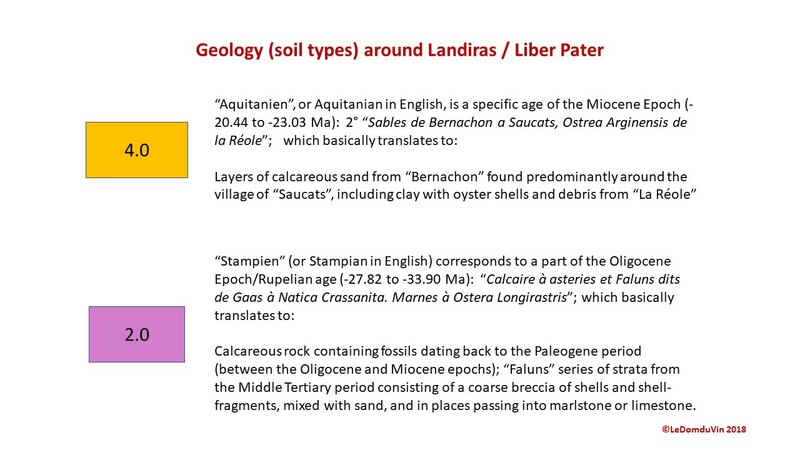 A type of soil very similar to the one found around the village "Saucats" (a few kilometers up north of Landiras). Here is a simplified Geological Timescale for you to better understand these different geological time periods and when the type of soil around Landiras and Liber Pater was formed. Underneath the upper layer of gravel soil, this type of sub-soil, somewhat unique (as it can only be found as patches throughout the whole Bassin Aquitain) and rich in sedimentary rocks containing fossilized skeletal fragments of marine organisms such as coral, forams and molluscs (such as oysters), as well as minerals calcite and aragonite, forms a patch or an island around Landiras (see as indicated on the map above) and thus confers to Loïc's wines more complexity and depth than his neighbors with vines planted on the ground made of low terraces of "Quaternaire Ancien" (Ancient Quaternary Period - light green on the map above), which are less rich. 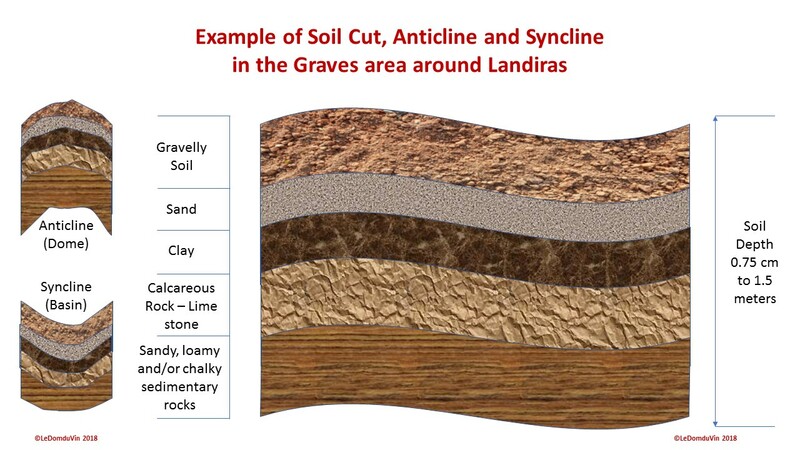 Here is again the example of a soil cut in the Graves area around Landiras for you to have a clearer understanding of the soil and sub-soil in mind. Moreover, the layer of sand prevents the Phylloxera from living, reproducing, spreading, and more importantly attacking the vine's roots and leaves, hence allowing for "Franc de Pied" vines to be planted and no need for grafting, and enabling Loïc to plant pre-Phylloxera grapes that used to exist in the region of Bordeaux back in 1955. 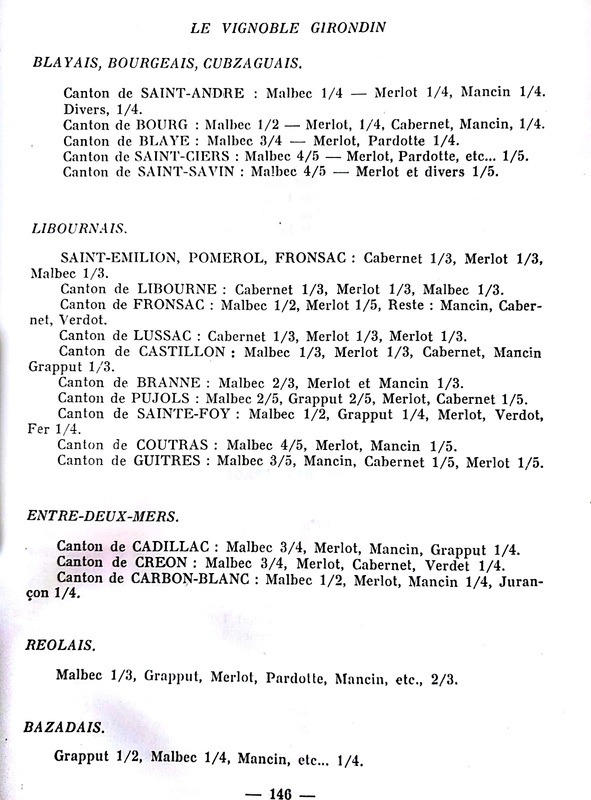 When Loïc bought Liber Pater's vineyard in 2005, it was already planted with the usual grape varieties allowed by the AOC in the Graves appellation, which nowadays represent about 60% Cabernet Sauvignon and 40% Merlot for the reds and 80% Semillon and 20% Sauvignon Blanc for the whites. The white being made from vines about 80-85 years old in average, and about 40 years old vines in average for the reds. 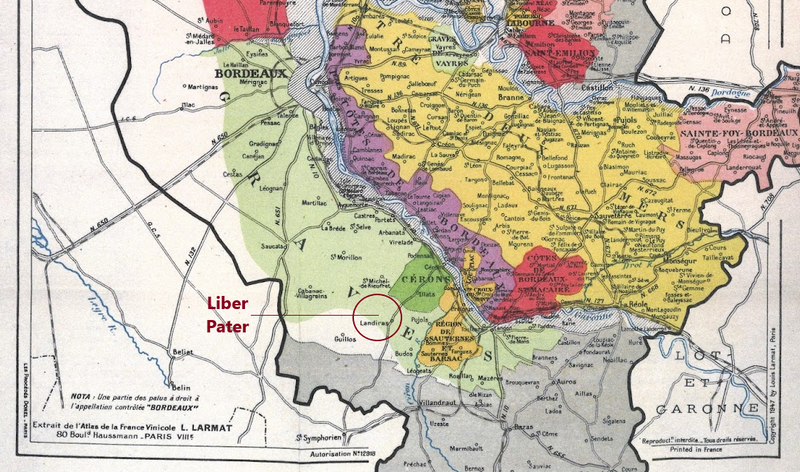 The first vintage of Liber Pater under his full control was 2006. In 2011, not deviating from his idea to recreate the taste of pre-Phylloxera Bordeaux wine by replanting and growing ungrafted vines of autochthonous grape varieties (that used to exist in Bordeaux back in the mid-19th century), and thus take part in the comeback of the ungrafted pre-Phylloxera grape varieties in Bordeaux; and also eager to put to the test his believe (that it is the only way to retrieve the authentic taste, complexity and aging potential of the wine of Bordeaux as it used to be prior 1960s when vines started to be uprooted and grafted on American rootstocks due to the Phylloxera plague), Loïc concretized his project (his dream should I say) by planting old forgotten (and not allowed by the INAO in the AOC Graves) grapes varieties such as Castet, Mancin, Tarney Coulant and Marselan. 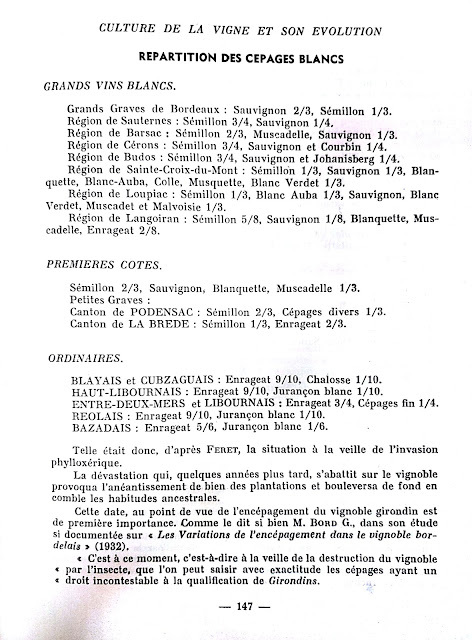 "Le Vignoble Girondin" de Germain Lafforgue 1947 - ©L. 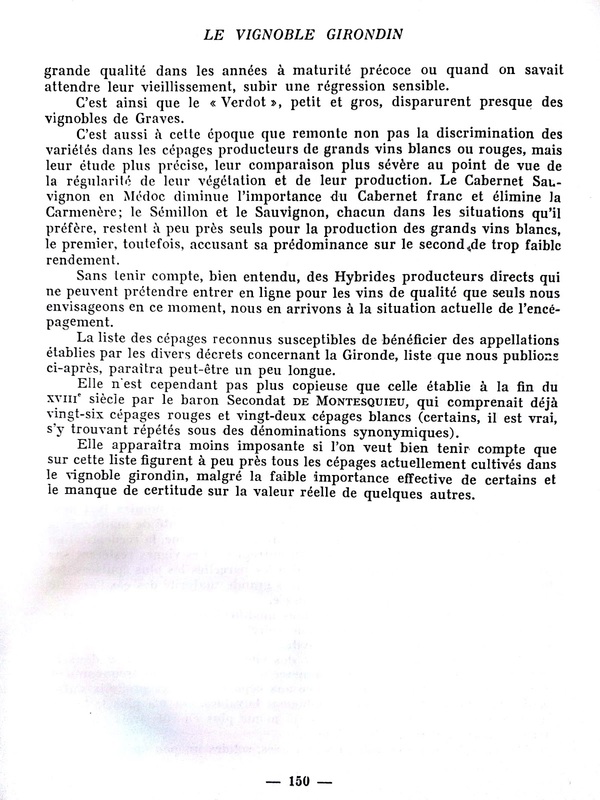 Larmat edition "Page 144"
"Le Vignoble Girondin" de Germain Lafforgue 1947 - ©L. 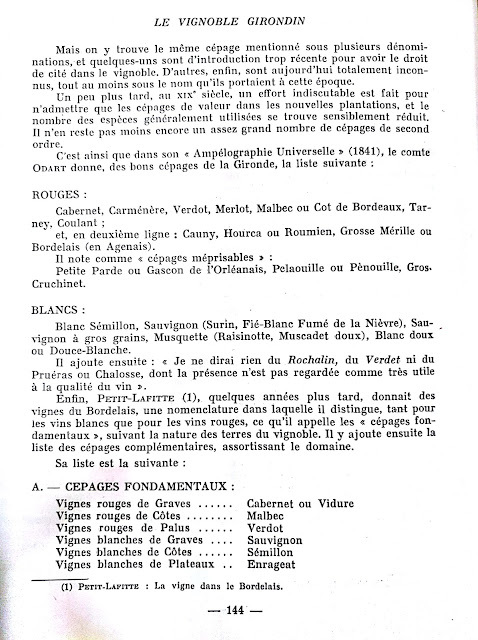 Larmat edition "Page 145"
"Le Vignoble Girondin" de Germain Lafforgue 1947 - ©L. 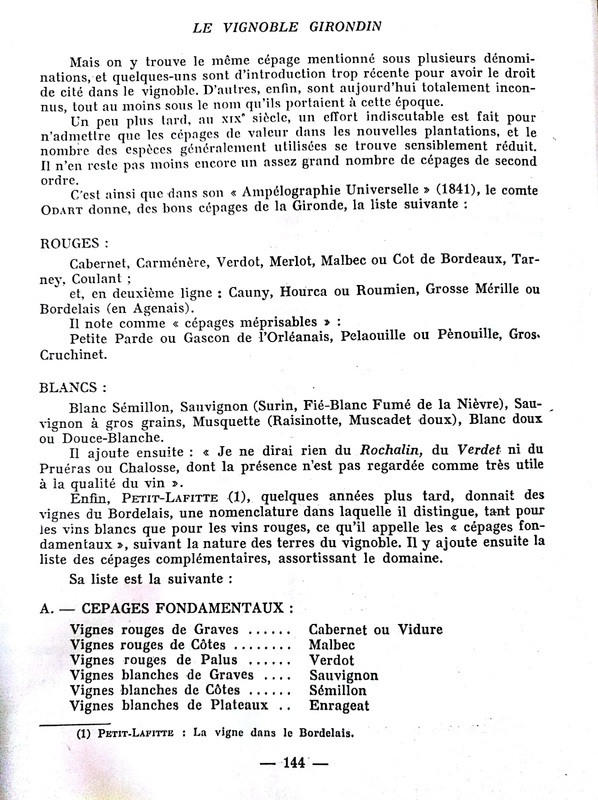 Larmat edition "Page 146"
"Le Vignoble Girondin" de Germain Lafforgue 1947 - ©L. 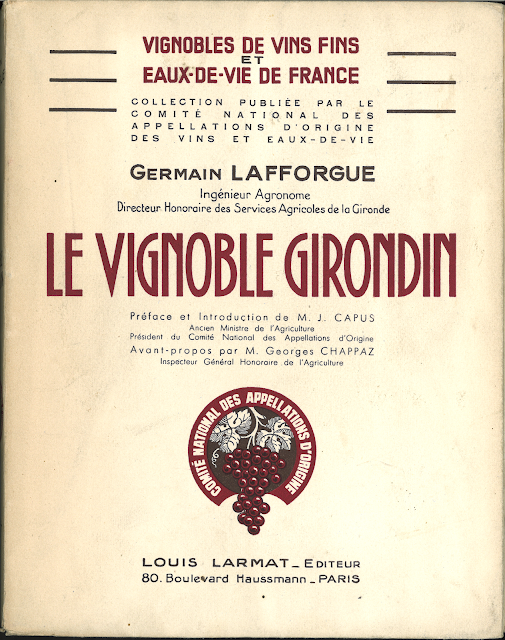 Larmat edition "Page 147"
"Le Vignoble Girondin" de Germain Lafforgue 1947 - ©L. Larmat edition "Page 148"
"Le Vignoble Girondin" de Germain Lafforgue 1947 - ©L. 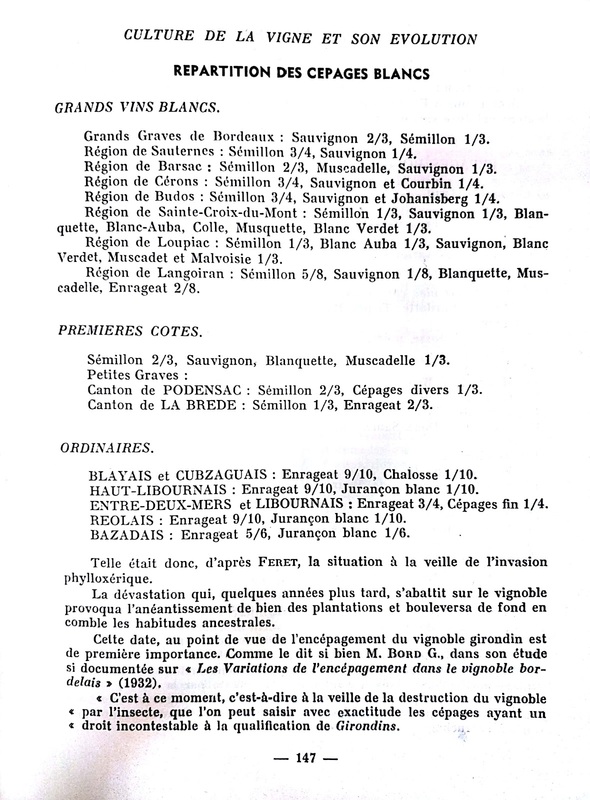 Larmat edition "Page 149"
"Le Vignoble Girondin" de Germain Lafforgue 1947 - ©L. Larmat edition "Page 150"
Let me try to resume all these pages in a visual as I like to do them... (easier to understand).